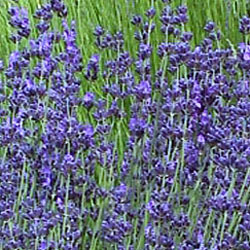 This cultivar of English lavender has nice, dark purple flowers that appear throughout the summer. It is one of the last English lavenders to bloom each autumn and is very productive. A very popular cultivar for commercial oil productionThe flower stems spray out around the plant and the growth is not as compact as some other cultivars. The calyx color is dark purple; the corolla violet.